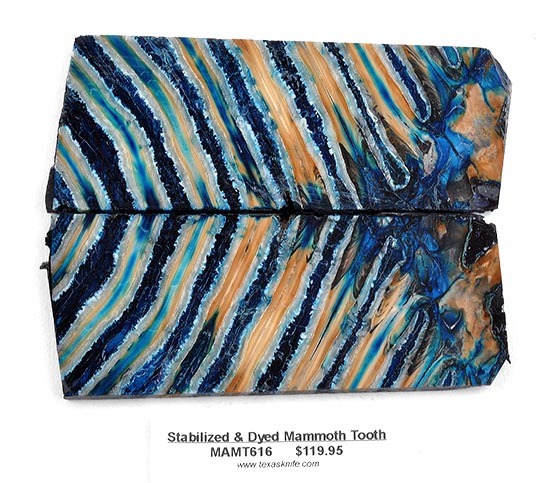 Fossilized Mammoth Teeth Scales -- Only One Available! Only ONE available with this exact color and pattern! Mammoths ruled the arctic during the last Ice Age. These bookmatched scales are cuts of their fossilized teeth, and are several tens of thousand years old. They have been dyed and stabilized. Exceptionally unique. One of a kind 3-5/8" x 1-7/16" x 3/16"
Dimensions are measured to the smallest edge. Angled corners and sides are not included in these lengths, which means your actual piece will be slightly bigger.